Imagine! Everything you need to make your next trade show or presentation a resounding success is now available in one package. 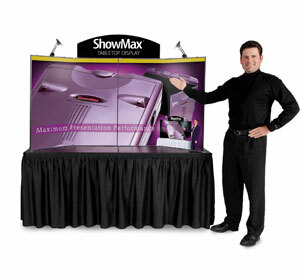 ShowMax® tabletop displays set up in less than a minute, with no cases or padding materials to put away. Graphics can stay attached and remain inside for transport, so they're ready to show when you open the display. And you'll surely appreciate the in-line skate wheels that facilitate moving around large exhibition halls. Save money on accessories, as the ShowMax® includes two LumaStar™ 12V LED lights, an arched header, and molded-in storage compartments for literature. 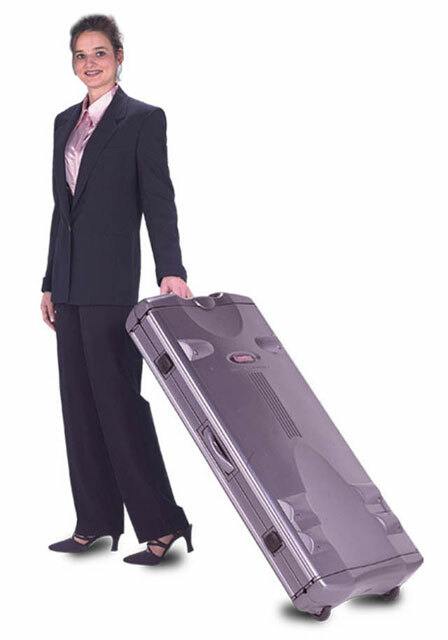 The design eliminates the need for extra shipping cases. ShowMax® features strong, blow-molded, double-wall reinforced polyethylene panels joined by co-extruded hinges. Once you fold it up, precision lockable latches are on the job to keep your presentation safe and sound until the next show. 6′ wide, includes two lights, weighs 39lbs, available in three fabric colors. Includes the printing of your artwork onto an arched header and detachable panel graphics.